My father died in an accident back in 1975 when my brothers and I were just kids. 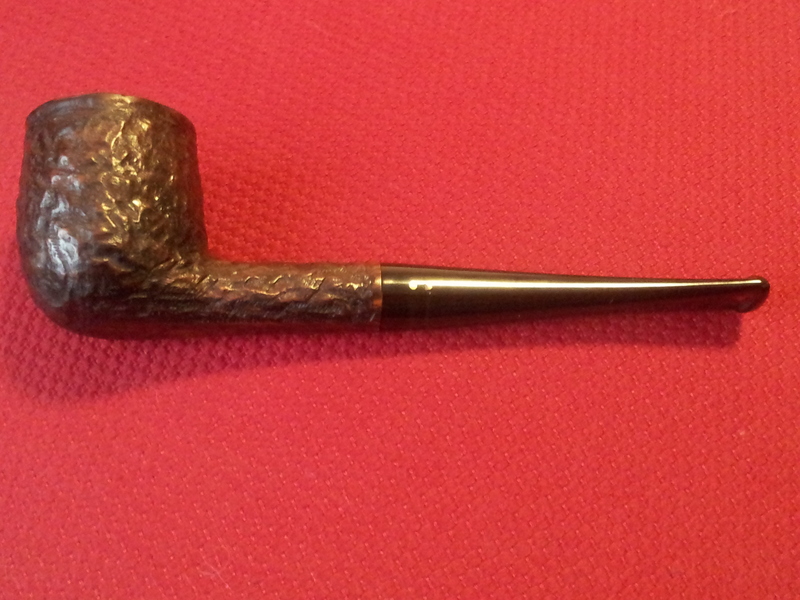 He was a pipe smoker, with a modest collection started with a humble One-Dot Brigham billiard back in the late 1950’s. He must have liked it well enough, because by the early 1970’s the bulk of his pipes were Brighams, interspersed with a few meers. When we got old enough, my mother split up the pipe collection among the five of us boys, though the lion’s share of the pipes seems to have come to me. 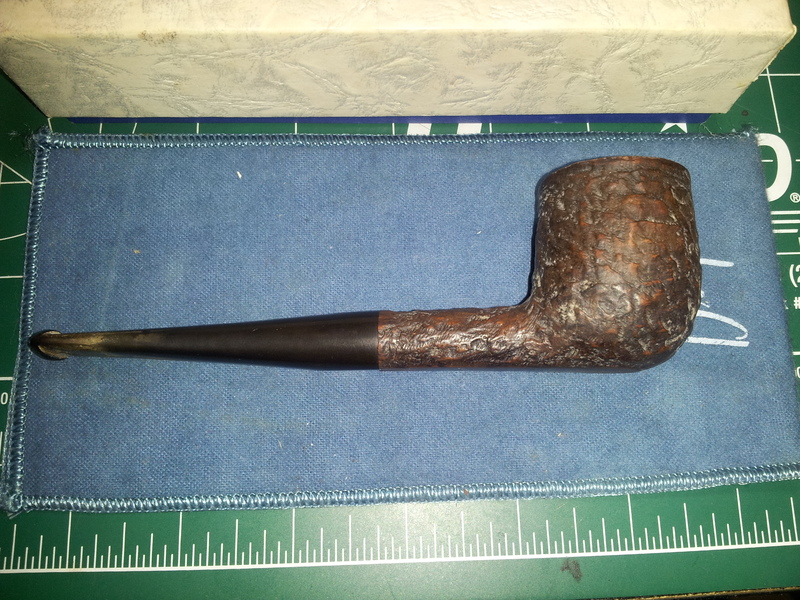 Indeed, it became the heart of my collection, the starting point of my pipe restoration journey, and the inspiration for this blog. 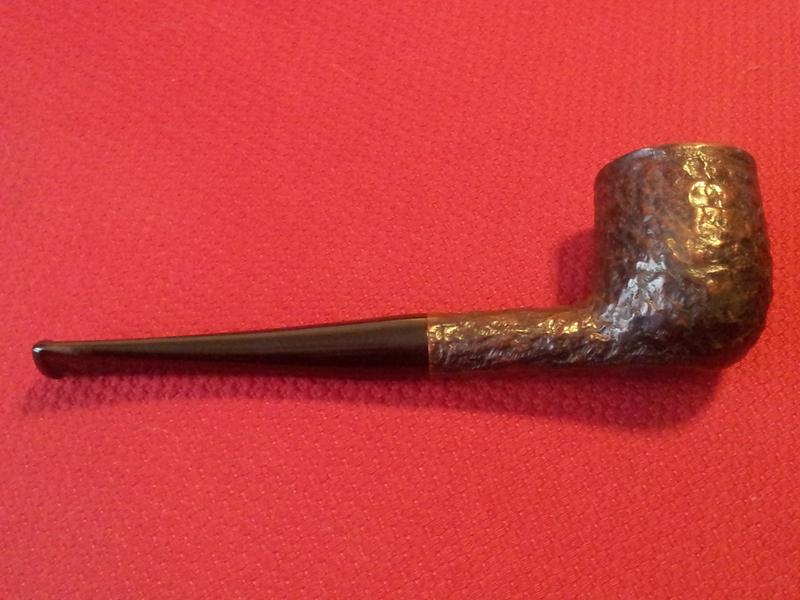 So when offered the chance to work on another of Dad’s pipes, I jumped at the opportunity. One of my brothers was visiting and saw my collection of refurbished estate pipes. 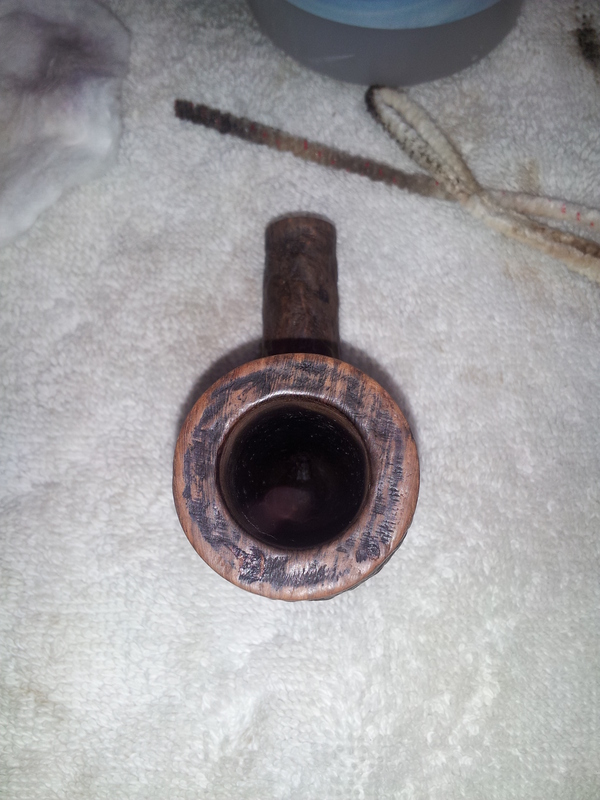 He said he thought he had one of Dad’s pipes at this place, and would I clean it up for him? You bet! 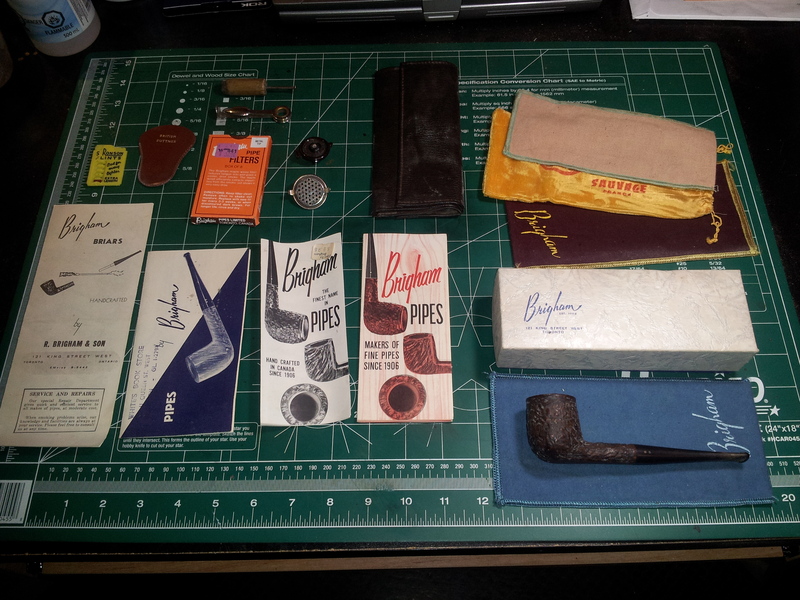 The next time we saw each other, my brother passed me an old cigar box containing the pipe “and a few other things”. I was to clean up the pipe and also sift through the rest of the contents of the box and separate the wheat from the chaff. I took the box home, but didn’t get a chance to open it up until the following day. And what a day – I was like a kid at Christmas! 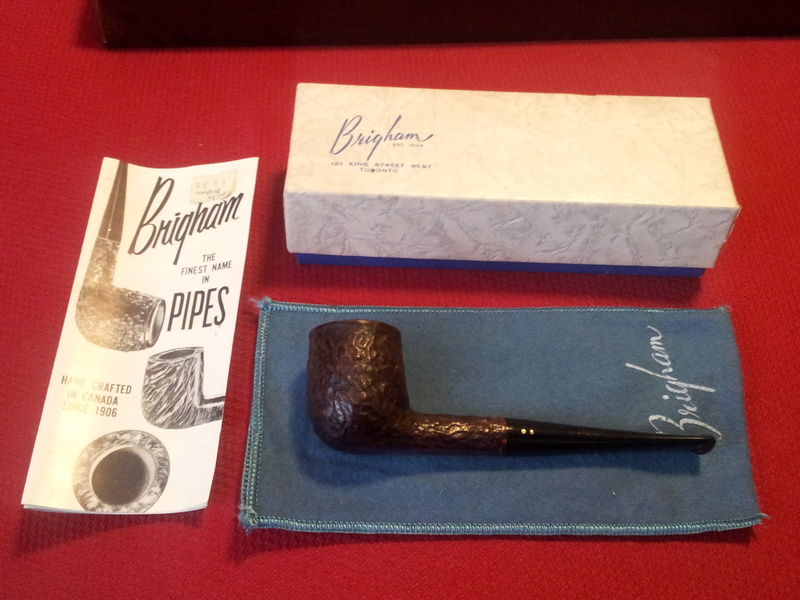 I opened up the cigar box to find the pipe in question, complete with original sales box, Brigham pipe sock and literature. Tucked underneath was a pile of other pipe-related things, including three more Brigham pipe leaflets, three pipe socks (one Brigham, one unmarked, and a GBD Sauvage (I wonder where THAT one is! 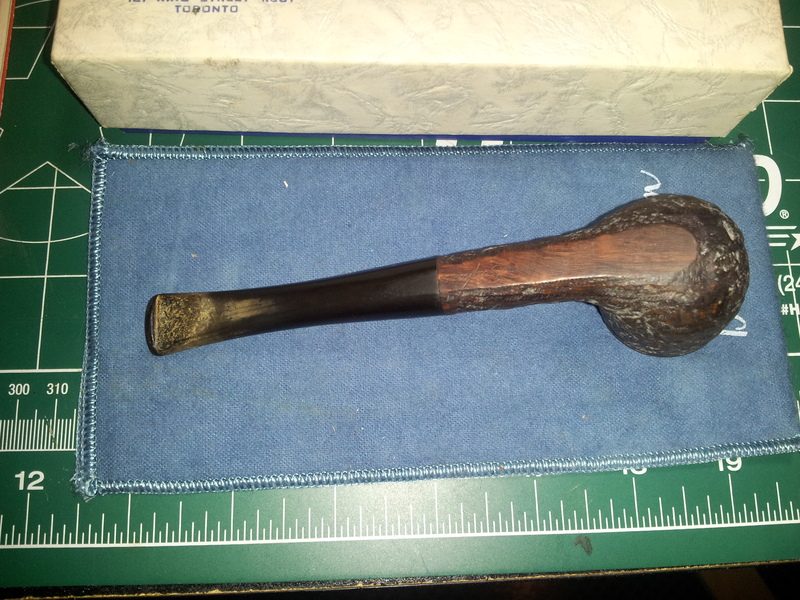 ), a Czech pipe tool, two snap-on pipe screens, a home-made tamper and Dad’s leather tobacco pouch. What a treasure trove! I dug a bit more and discovered a partial box of Brigham rock maple filters, a pack of Ronson lighter flints and the storage pouch for a British Buttner reamer, though alas no reamer. 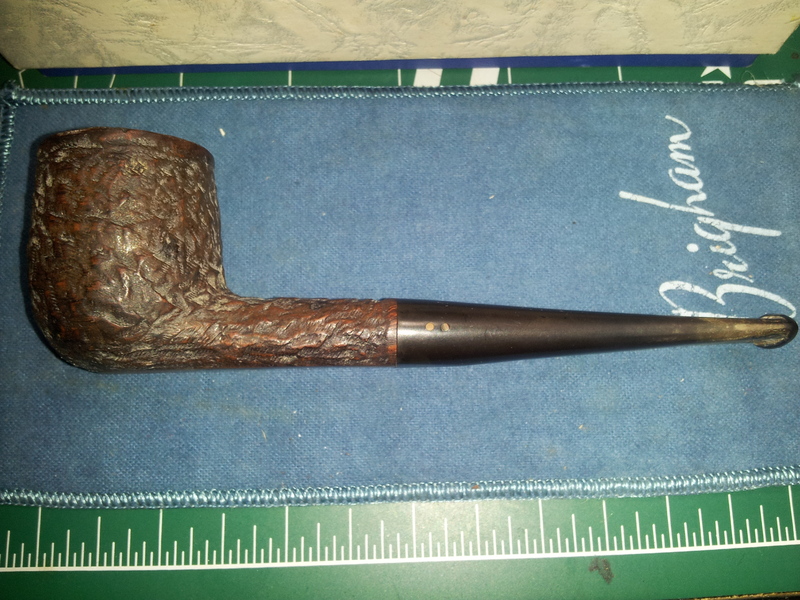 I’m writing up the Brigham literature for a separate post, so I’ll devote the remainder of this post to the pipe refurb itself. I was thrilled to realize that I’d never seen this pipe before, or at least if I had I had been too young to remember it. 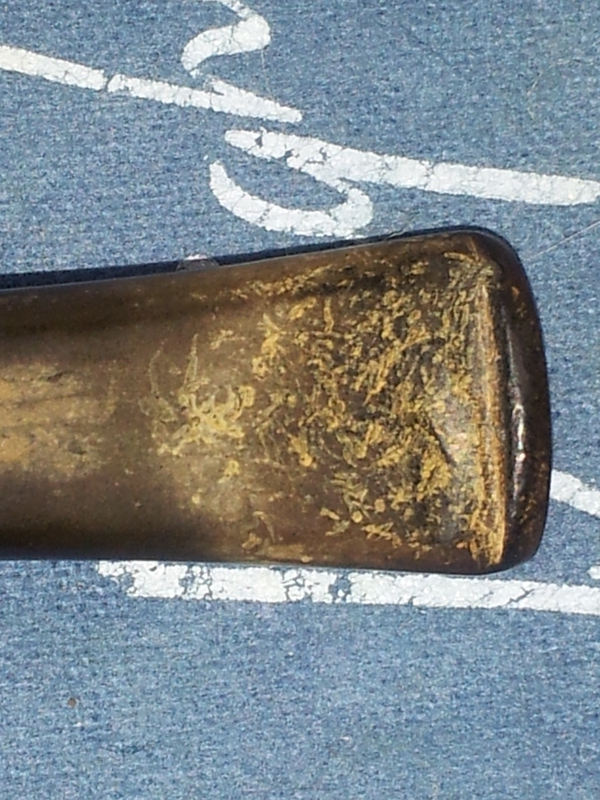 It is a 2-dot Brigham, stamped “203, Made in Canada, Brigham” on the flat underside. 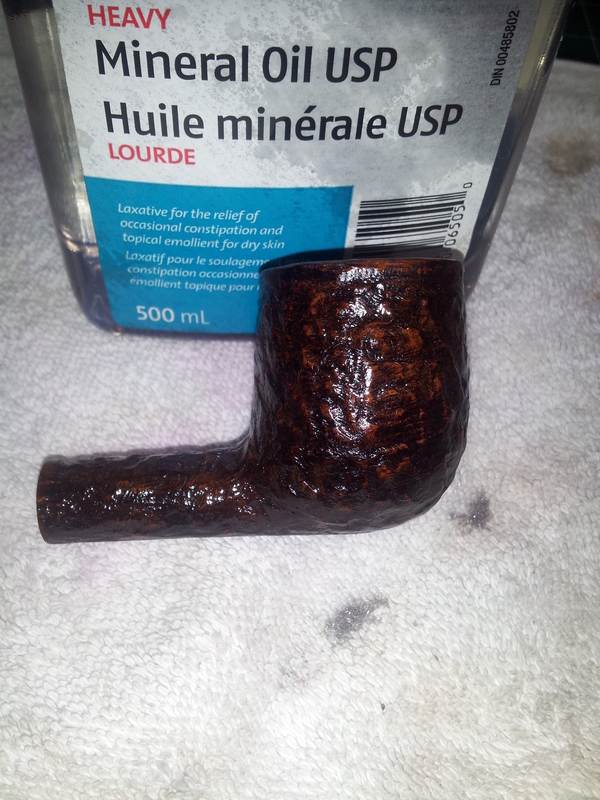 The bowl was dusty, with a healthy layer of gunk deep in the pores of the rusticated finish. The rim was tarry, and the bowl had a solid, though well-trimmed, layer of cake. Clearly Dad had used the Buttner reamer on this one. 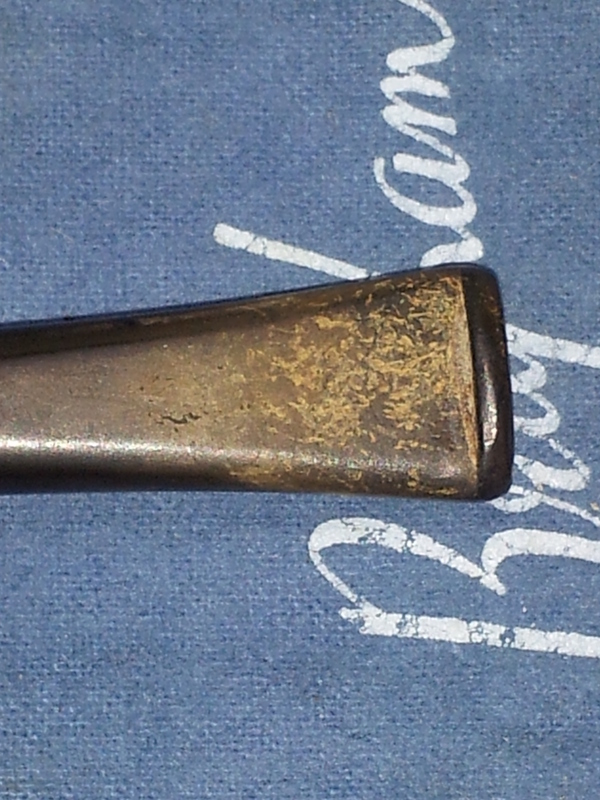 The stem was lightly oxidized, with calcium build-up in the bite area, and there were several deep tooth dents top and bottom right behind the button. Overall, I thought the pipe was in good shape, considering it had likely been put back in its box after Dad’s accident and left alone for 40 years. 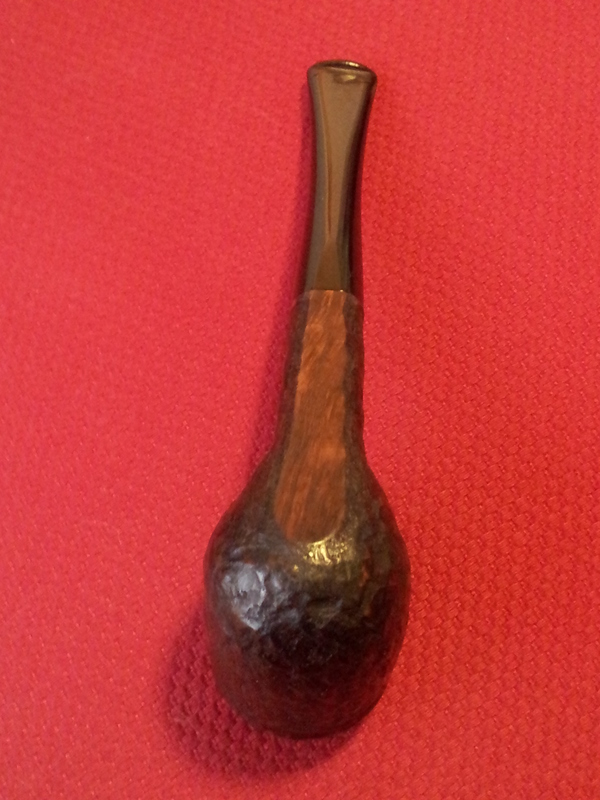 I started the clean-up like all my estate refurbs, by reaming the bowl back to briar. Happily I found no major issues hiding underneath, though it appears that Dad had a bit of a heavy hand with the reamer. The floor of the tobacco chamber is slightly over-cut in the centre. 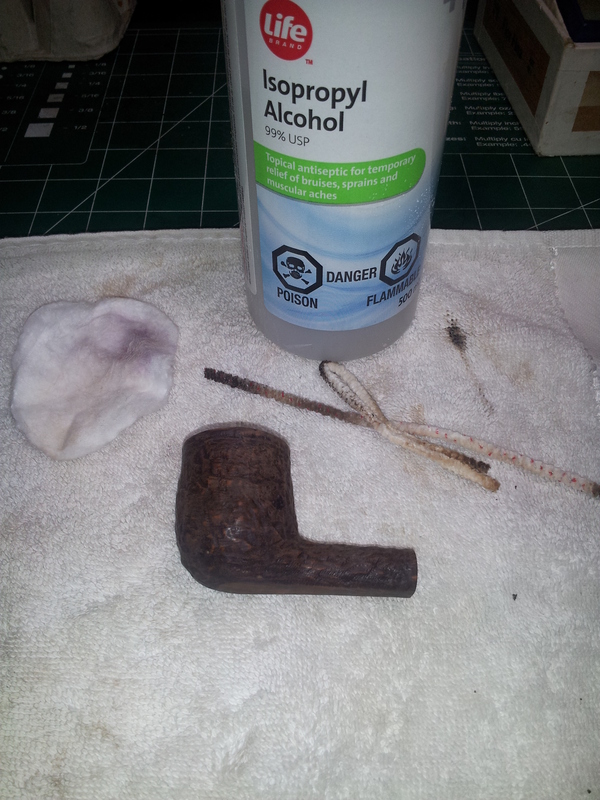 I cleaned the stummel’s internals with pipe cleaners and isopropyl alcohol. It didn’t take more than a few cleaners to freshen up the airway. 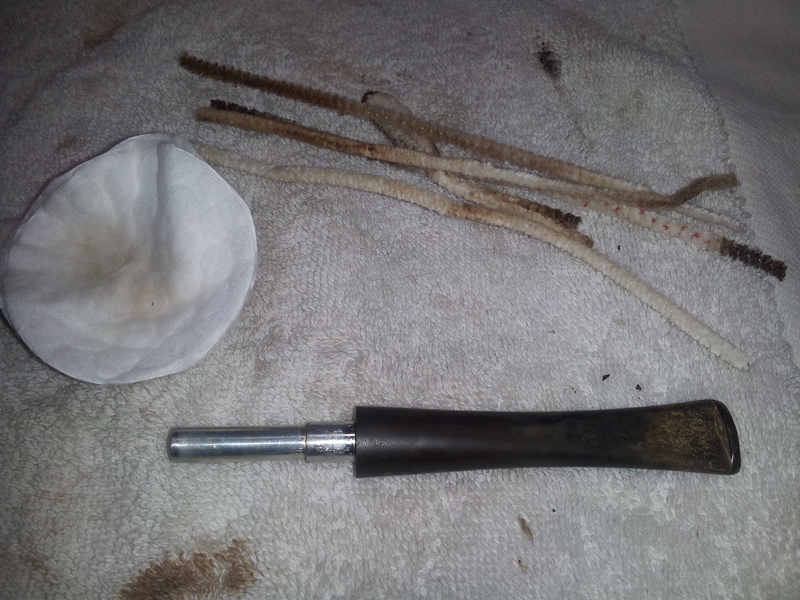 The stem’s internals were likewise pretty clean, and the rock ample filter looked unused. My guess is that Dad had cleaned the pipe shortly before his passing. I finished up work on the stummel with a good wipe with mineral oil to liven up the finish and add a bit of moisture back into the briar. The oil really seems to give these old Brigham finishes a visual punch, allowing the reds and browns of the briar to shine through the darker top stain. The following day, I retrieved the stem from the Oxyclean, and sanded off the oxidation and other contaminants with 600 – 2000 grit wet papers. 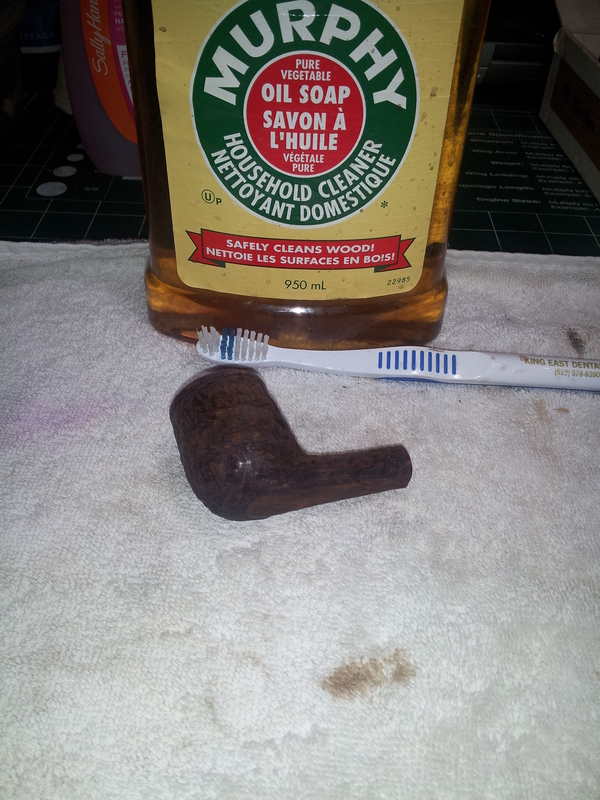 After consulting with my brother, I left the tooth dents alone, wanting to preserve the pipe as Dad left it rather than restore it to new condition. I have done the same with all his pipes – a perhaps quirky tribute to a man taken from us when I was a preschooler. Both stummel and stem were ready for final polishing, so it was off to the buffing wheel for a run of White Diamond and Carnauba Wax. I shot these pictures of the finished pipe just before slipping it into its sock and placing the lid on the distinctive blue and silver Brigham box. 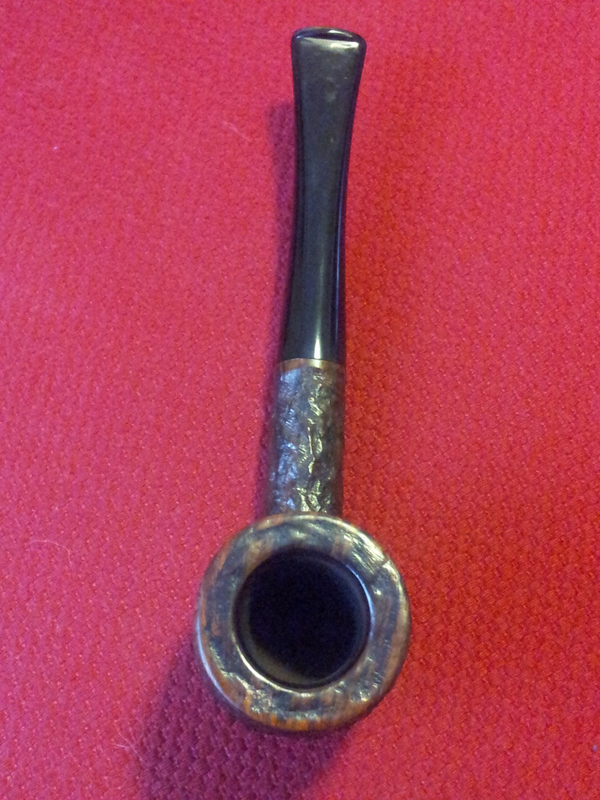 It’s ready to go back to my brother, who I know will appreciate the pipe for another 40 years. What a great treasure trove of memories from your father. Thanks Al. It was quite a surprise to me. 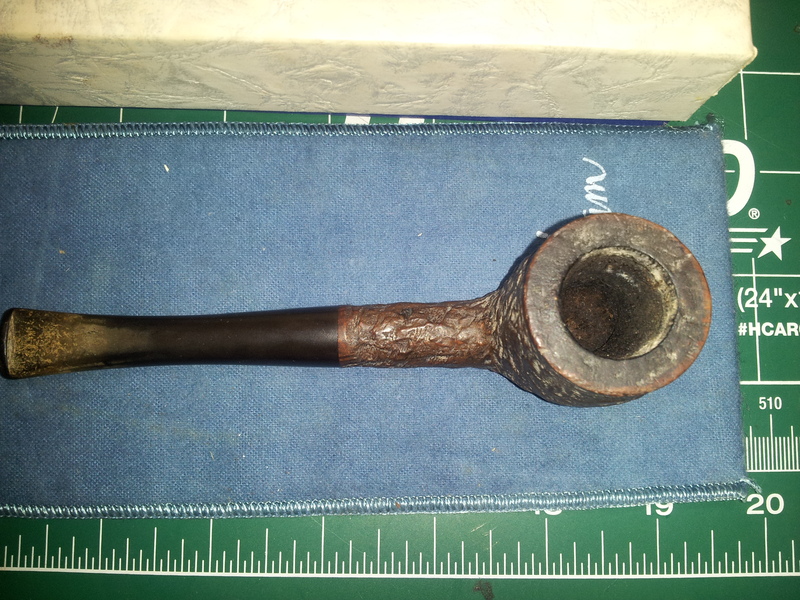 My brother was really happy to have the pipe presentable again – he’s going to display it now instead of hiding it in a drawer. He also gifted me the Brigham ads, which I appreciated. What a great memory Charles. Even having the brochures is pretty amazing. You should scan them and put them on the blog. There will be some great older information in them… well done on the refurb. I love these old Brighams. They are well made and I have yet to find one that was not a great pipe. Well done Charles.